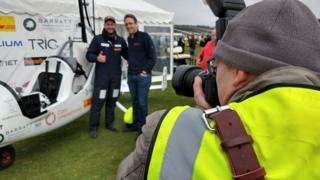 A man has started his attempt to become the first person to fly solo around the world in an open-cockpit gyrocopter. James Ketchell, 37, from Basingstoke, took off from Popham Airfield in Hampshire at about 14:20 BST. His mission will cover 22,859 miles (36,787 km) at an average speed of 70 knots, and he is expected to face extreme weather conditions. "When you find what it is that you love, take that and run with it... that's all I'm doing," he told the BBC. Mr Ketchell's route on his Magni M16C tandem gyrocopter will take him through Europe, across the Bering Straits from Russia to Alaska, then Canada, the mainland US, the Atlantic Ocean, Greenland, Iceland, Scotland, and Northern Ireland, before returning home. He intends to raise money for charity and visit a school in each country he flies over. The journey, with stops, is expected to take five to six months. He said: "I was a young man who really struggled. I used to lie in bed all day, I was lazy, and now things have changed. "I would like this mission to convey to young people that every single person has the ability to be whoever they want to be and do whatever they want to do." He added: "We'll encounter some problems. There's some huge water crossings and if you get stuck in bad weather you have to make a decision. Do you turn back? Do you carry on? "I'm passing through a whole range of climates and weather systems, but actually, once you understand how the aircraft works, they're very stable and they're actually very safe." In 2007 Mr Ketchell was left with broken legs and a broken and dislocated ankle after a motorcycle accident. But it gave him a new lease of life, and he went on to row 3,000 miles across the Atlantic, climb to the summit of Everest, and cycle around the world unaided.